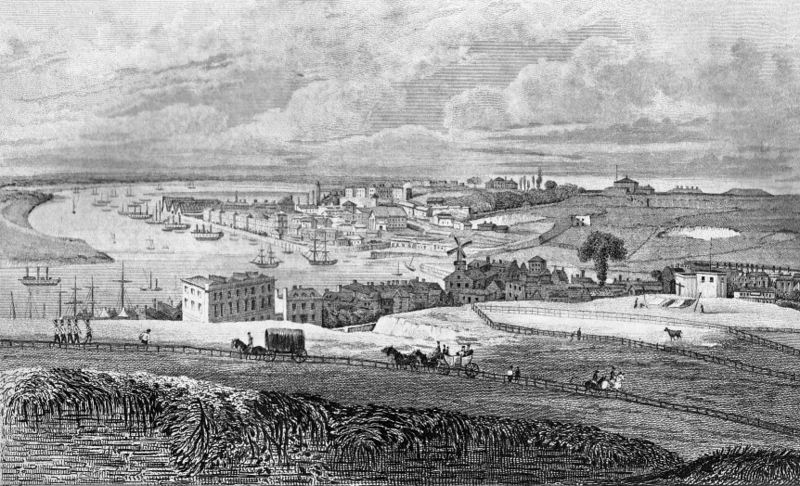 Chatham Dockyard from Port Pitt, engraved by R.Rolfe, published in Ireland’s “History of Kent” 1831. We know that Inez stayed on in Chatham because six years after the departure of Captain Vignoles, the 1851 Census Research 8-1 shows she was occupying a house at 89 Clover or Clarence Street. (The handwriting is difficult to read, but both these street names exist today in Chatham, with Clover Street being closer to the old town centre.) She recorded herself as the head of the household, Inez Vignoles, wife of an Army Captain, married, female, aged 28, born in Spain, and her four children Fanny Vignoles, daughter aged 12, born in Port Phillip, Melbourne, Helena Vignoles, daughter, aged 11, born in Port Phillip, Melbourne, Charles Vignoles, son aged 9, born in London, Frank Vignoles, son aged 7, born in London. Was she receiving support from Captain Vignoles or was she just using his name to ensure her respectability in the army community of Chatham? As well as Inez and her children two other women are recorded as living at this address. One is Anne J. Bowles aged 27 with son Joseph aged 2 years, who were both born in Kent, and the other is Maria Batman aged 24, born in Van Diemen’s Land and listed as a servant. This is most likely to be Maria Caroline Batman, daughter of John’s brother Henry, rather than John’s own daughter Maria, whose life in regional Victoria is fairly well documented. How Inez supported herself and her children in these years is a mystery but presumably (or hopefully) Dr Cotter had contributed towards the upkeep of the children. The fact that she was openly living as Inez Vignoles, wife of Captain Vignoles, in an army town, perhaps indicates that she was receiving some sort of financial help from Captain Vignoles. Did Captain Vignoles intend that Inez and the children should join him in Queensland, or was the affair over with the death of their baby? Did Inez have the opportunity to return to Victoria with Dr Cotter in 1846 or were they mutually agreed that their marriage was over? Did Dr Cotter abandon the family when he discovered that Inez was living as Vignole’s wife? Certainly, the Satirical Manuscript indicates that his attitude was one of unforgiving disgust with his wife’s unfaithfulness. I may say deserted as for I have had the whole responsibility of bringing up a family of four children on myself for the last twenty years, having been brought up in and distantly related to the Fitzwilliam family with their assistance I have succeeded in educating and bringing them up respectably and with credit but through many a bitter struggle and heavy trials. Again, we have to read Inez’s words with a broader view. She was hoping to gain financially from this letter and so it was in her interest to emphasise her poverty and her worthiness. She does not state, for example, that in 1854, three years after she recorded herself as Inez Vignoles, she remarried. She married James Thomas Hobbs, a bachelor and shipwright on 22 October 1854. 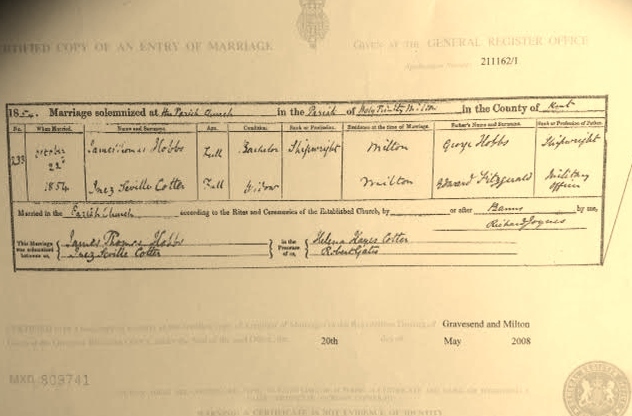 The marriage certificate states that the marriage took place in Milton, Kent and that she was a widow at the time. Certainly, seven years had elapsed since Dr Cotter left her in 1847, and that was the usual period for a woman to wait before declaring herself a widow. The next we hear of Inez is her arrival, six years later, in Sydney aboard Lloyds on May 5th 1860. The interesting thing about her arrival is that she travelled under the name Cotter. 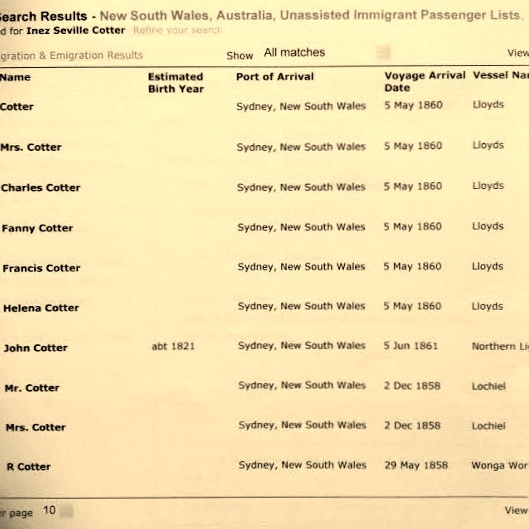 The ship’s list clearly shows Mrs. Cotter with Fanny Cotter, Helena Cotter, Charles Cotter and Francis Cotter. There is a passenger simply listed as Cotter. Perhaps this was Hobbs as he did also come to Australia. Fanny was at the time married to WH Smith and a passenger named Mr Smith is listed. It is fairly obvious that the reason for reverting to Cotter is that Inez had returned to Melbourne for financial reasons. In this she was following the advice of Earl Fitzwilliam who believed that she was entitled to pursue the Right of Dower, meaning that she was entitled to one third of the profits from her husband’s land sales. I had to struggle through years and years of penury and trial my children educated and brought up – I return thinking to claim my interest in that Property once ours- as a Wife by claiming compromise, by way of Dower, which I never gave up, but the owners refuse the slightest compensation and are borne out by an edict that no Woman married after 1837 may claim any right of Dower – alas! 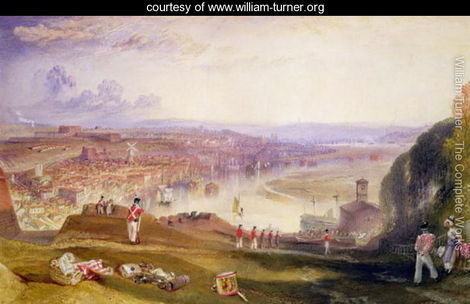 The short time of fifteen days exclude me and mine from Justice and to give an idea of the profit upon the Property to the after holders the corner allotment of Bourke and Swanston Street, originally purchased from the Crown by my Husband sold some ten years ago for 210 pounds per foot and realised it is said near sixty thousand pounds (60,000 pounds) – where I was married and where my two daughters were born and we are and have been starving. As to the law made and passed I have nothing to say- but that under the circumstances I have briefly sketched some consideration might be made in my favour as the only one who could possible ask for such a boon, there are but two or three left now of that early band, and not one who can repeat the sufferings and wrongs that I could, if therefore, I may crave nothing else I may truly crave your Grace’s pity. Inez had no success in pursuing the Right of Dower or in her appeal for employment for her sons ‘by which they may give myself and their sisters bread’. 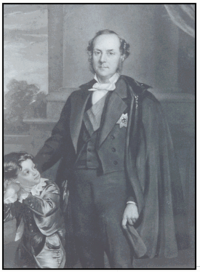 At the time her two boys were aged 19 and 18, but she also had her husband James and her son-in-law, W.H. Smith, able to provide for her. It is safe to say that Inez was using every avenue, saying anything necessary, to secure the future and perhaps, given her history, this was the only way she knew to survive.